FlashFXP is a powerful FTPclient for windows, and it is very popular to be used to publish and maintain websites. FlashFXP is easy to use, from less technical individuals to industry class professionals, anyone can master FlashFXP. How to increase FlashFXP timeout? Here is the instruction. 2. Run this program and click “Options” from the menu bar at the top of the software. Click “Preferences. 3. Click the “Connection” tab. 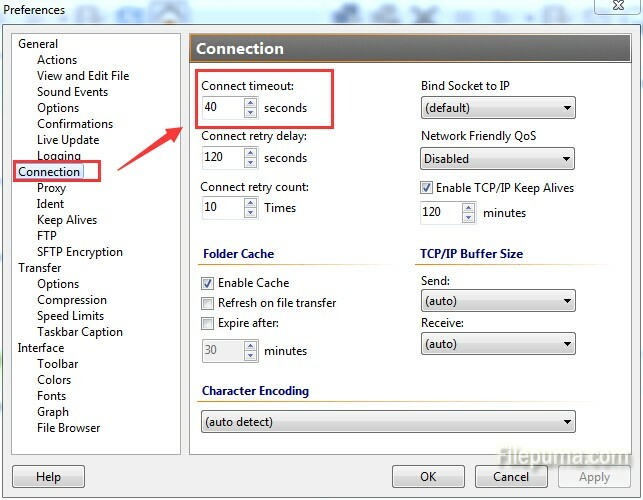 Change the time next to “Connect timeout”. 4. Click “OK” to save the settings. Now you’ve successfully increase FlashFXP timeout.